Blues Bass Lines for Piano/Keyboard in all 12 Keys is a comprehensive guide to blues bass patterns from beginner to advanced levels. 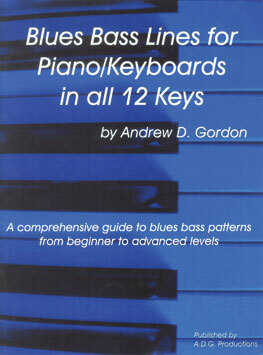 Gordon includes 50 different blues bass lines which increase in difficulty played in 12-bar blues patterns in all 12 keys. Blues Bass Lines for Piano/Keyboard is easy to use, offers background information and tips on right hand melodic improvisation. Chords are identified by chord names ( C7, G, F, etc.) and structure (I, IV, V) for easy to understand harmonic structure.